Golden Harvest/Golden Studios was founded in 1970. 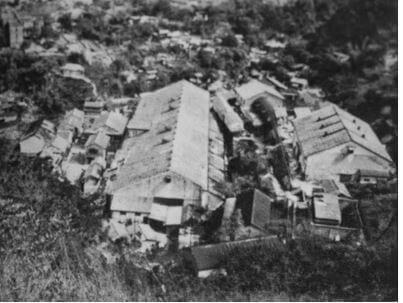 When the Cathay Organisation withdrew from film production in HK, Golden Harvest took over their old studios at 8 King Tung Street, Hammer Hill Road, Diamond Hill. The studio was later used to make films by independent companies set up by artistes who then struck a deal with GH for funding, distribution etc. These included Golden Way, Bo Ho Films and Hui’s Film. In the late 1970s the studio was was occasionally rented out to other film companies. Philip Edward Kenny writes about the above aerial photo: The studio lot is the triangular area in the top right. I’ve oriented the photo so that east is at the top, it makes viewing easier I feel, but in reality remember that really the picture should be rotated 90 degrees to the right. The lot was demarcated by hills to the top and right (east and south) and a stream to the left (north) and the point where the stream meets the road is where the studio’s front gateway was. Phil has considerably more information on his excellent blog. He adds, It’s worth pointing out that under the banner of “film studios” is a plethora of companies involved in various stages of film making. Some companies were just monetary vehicles that provided funding, some provided post-production facilities, a small number actually had studio space, some were only involved in distribution and some did everything, like Golden Harvest and Shaws. You’ll find the number of film companies increased massively in the 1970’s when Golden Harvest set up operations. The studio system was based on the US one in that GH would provide funding, equipment, space, post production facilities and distribution for the smaller independent companies set up by the various artistes. As a result the film makers enjoyed more freedom and a greater share of the profits and it meant GH were behind hundreds of films throughout the 70’s and 80’s. 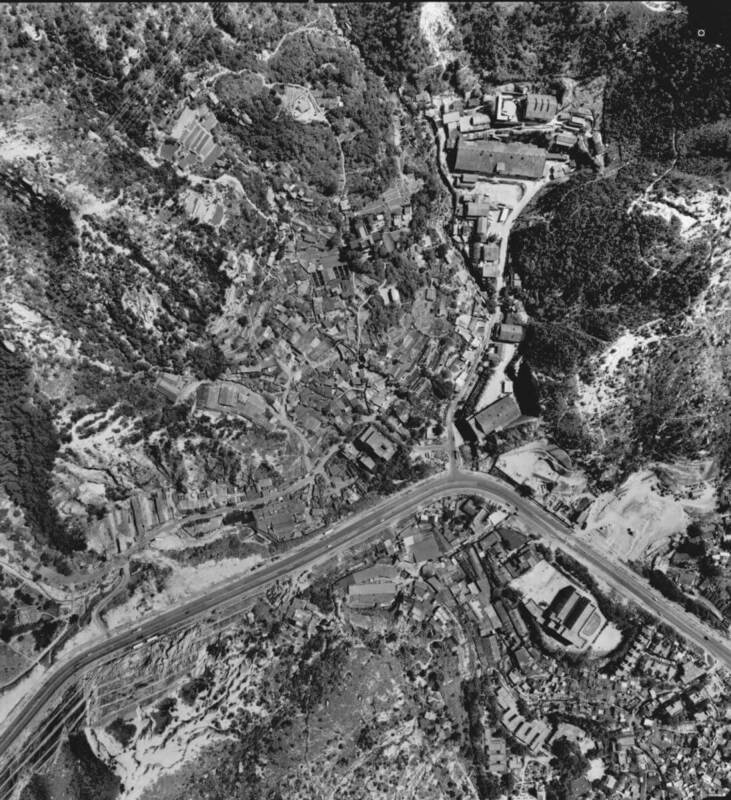 The above, undated, oblique photo is one of a set which show the studio in Diamond Hill, a film set, Jackie Chan and others. See Source 2 below. Notable names in the company include its founders, the veteran film producers Raymond Chow (鄒文懐) and Leonard Ho (何冠昌). Chow and Ho were executives with Hong Kong’s top studio Shaw Brothers but left in 1970 to form their own studio. They succeeded by taking a different approach from the highly centralized Shaws model. Golden Harvest contracted with independent producers and gave talent more generous pay and greater creative freedom. Some filmmakers and actors from Shaws defected. But what really put the company on the map was a 1971 deal with soon-to-be martial arts superstar Bruce Lee superstar with the filmThe Big Boss, after he had turned down the low-paying, standard contract offered him by the Shaws. In 1973, Golden Harvest entered into a pioneering co-production with Hollywoodfor the English-language Lee film Enter the Dragon (龍爭虎鬥), a worldwide hit made with the Warner Brothers studio and Concord Production Inc.
Golden Harvest supplanted Shaw Brothers as Hong Kong’s dominant studio by the end of the ’70s and retained that position into the ’90s. Its greatest asset for years was that from the 1980s until very recently, it produced almost all of the films of Jackie Chan. Golden Harvest has also produced a number of films with Jet Li and Donnie Yen. The Company was listed on the Hong Kong Stock Exchange in 1994. Golden Harvest’s activity has declined in recent years. In 2003, they withdrew from film-making to concentrate on film financing, distribution and cinema management in Hong Kong and in Mainland China. . In 2004, Li Ka-shing and EMI became shareholders of the company. 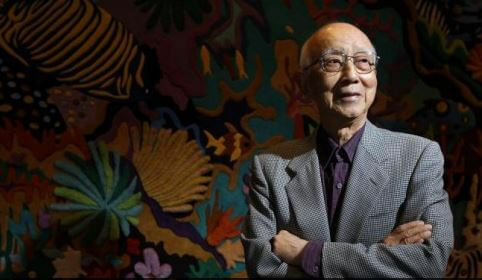 In 2007, Raymond Chow sold the company to Chinese businessman Wu Kebo, who owns the China-based Orange Sky Entertainment Group. In early 2009, Golden Harvest merged with Orange Sky and was renamed Orange Sky Golden Harvest (橙天嘉禾娛樂集團有限公司). This article was first posted on 11th September 2015.